tam—him; āpatantam—coming over furiously; saḥ—he; vilakṣya—seeing; dūrāt—from a distance; kumāra-hā—the murderer of the princes; udvigna-manāḥ—disturbed in mind; rathena—on the chariot; parādravat—fled; prāṇa—life; parīpsuḥ—for protecting; urvyām—with great speed; yāvat-gamam—as he fled; rudra-bhayāt—by fear of Śiva; yathā—as; kaḥ—Brahmā (or arkaḥ—Sūrya). According to the reading matter, either kaḥ or arkaḥ, there are two references in the Purāṇas. Kaḥ means Brahmā, who once became allured by his daughter and began to follow her, which infuriated Śiva, who attacked Brahmā with his trident. Brahmājī fled in fear of his life. As far as arkaḥ is concerned, there is a reference in the Vāmana Purāṇa. There was a demon by the name Vidyunmālī who was gifted with a glowing golden airplane which traveled to the back of the sun, and night disappeared because of the glowing effulgence of this plane. Thus the sun-god became angry, and with his virulent rays he melted the plane. This enraged Lord Śiva. Lord Śiva then attacked the sun-god, who fled away and at last fell down at Kāśī (Vārāṇasī), and the place became famous as Lolārka. yadā—when; aśaraṇam—without being alternatively protected; ātmānam—his own self; aikṣata—saw; śrānta-vājinam—the horses being tired; astram—weapon; brahma-śiraḥ—the topmost or ultimate (nuclear); mene—applied; ātma-trāṇam—just to save himself; dvija-ātma-jaḥ—the son of a brāhmaṇa. In the ultimate issue only, when there is no alternative, the nuclear weapon called the brahmāstra is applied. The word dvijātmajaḥ is significant here because Aśvatthāmā, although the son of Droṇācārya, was not exactly a qualified brāhmaṇa. The most intelligent man is called a brāhmaṇa, and it is not a hereditary title. Aśvatthāmā was also formerly called the brahma-bandhu, or the friend of a brāhmaṇa. Being a friend of a brāhmaṇa does not mean that one is a brāhmaṇa by qualification. A friend or son of a brāhmaṇa, when fully qualified, can be called a brāhmaṇa and not otherwise. Since Aśvatthāmā’s decision is immature, he is purposely called herein the son of a brāhmaṇa. atha—thus; upaspṛśya—touching in sanctity; salilam—water; sandadhe—chanted the hymns; tat—that; samāhitaḥ—being in concentration; ajānan—without knowing; api—although; saṁhāram—withdrawal; prāṇa-kṛcchre—life being put in danger; upasthite—being placed in such a position. The subtle forms of material activities are finer than grosser methods of material manipulation. Such subtle forms of material activities are effected through purification of sound. The same method is adopted here by chanting hymns to act as nuclear weapons. tataḥ—thereafter; prāduṣkṛtam—disseminated; tejaḥ—glare; pracaṇḍam—fierce; sarvataḥ—all around; diśam—directions; prāṇa-āpadam—affecting life; abhiprekṣya—having observed it; viṣṇum—unto the Lord; jiṣṇuḥ—Arjuna; uvāca—said; ha—in the past. arjunaḥ uvāca—Arjuna said; kṛṣṇa—O Lord Kṛṣṇa; kṛṣṇa—O Lord Kṛṣṇa; mahā-bāho—He who is the Almighty; bhaktānām—of the devotees; abhayaṅkara—eradicating the fears of; tvam—You; ekaḥ—alone; dahyamānānām—those who are suffering from; apavargaḥ—the path of liberation; asi—are; saṁsṛteḥ—in the midst of material miseries. Arjuna was aware of the transcendental qualities of Lord Śrī Kṛṣṇa, as he had already experienced them during the Kurukṣetra War, in which both of them were present. Therefore, Arjuna’s version of Lord Kṛṣṇa is authoritative. Kṛṣṇa is almighty and is especially the cause of fearlessness for the devotees. A devotee of the Lord is always fearless because of the protection given by the Lord. Material existence is something like a blazing fire in the forest, which can be extinguished by the mercy of the Lord Śrī Kṛṣṇa. The spiritual master is the mercy representative of the Lord. Therefore, a person burning in the flames of material existence may receive the rains of mercy of the Lord through the transparent medium of the self-realized spiritual master. The spiritual master, by his words, can penetrate into the heart of the suffering person and inject knowledge transcendental, which alone can extinguish the fire of material existence. tvam ādyaḥ—You are the original; puruṣaḥ—the enjoying personality; sākṣāt—directly; īśvaraḥ—the controller; prakṛteḥ—of material nature; paraḥ—transcendental; māyām—the material energy; vyudasya—one who has thrown aside; cit-śaktyā—by dint of internal potency; kaivalye—in pure eternal knowledge and bliss; sthitaḥ—placed; ātmani—own self. The Lord states in the Bhagavad-gītā that one who surrenders unto the lotus feet of the Lord can get release from the clutches of nescience. Kṛṣṇa is just like the sun, and māyā or material existence is just like darkness. Wherever there is the light of the sun, darkness or ignorance at once vanishes. The best means to get out of the world of ignorance is suggested here. The Lord is addressed herein as the original Personality of Godhead. From Him all other Personalities of Godhead expand. The all-pervasive Lord Viṣṇu is Lord Kṛṣṇa’s plenary portion or expansion. The Lord expands Himself in innumerable forms of Godhead and living beings, along with His different energies. But Śrī Kṛṣṇa is the original primeval Lord from whom everything emanates. The all-pervasive feature of the Lord experienced within the manifested world is also a partial representation of the Lord. Paramātmā, therefore, is included within Him. He is the Absolute Personality of Godhead. He has nothing to do with the actions and reactions of the material manifestation because He is far above the material creation. Darkness is a perverse representation of the sun, and therefore the existence of darkness depends on the existence of the sun, but in the sun proper there is no trace of darkness. As the sun is full of light only, similarly the Absolute Personality of Godhead, beyond the material existence, is full of bliss. He is not only full of bliss, but also full of transcendental variegatedness. Transcendence is not at all static, but full of dynamic variegatedness. He is distinct from the material nature, which is complicated by the three modes of material nature. He is parama, or the chief. Therefore He is absolute. He has manifold energies, and through His diverse energies He creates, manifests, maintains and destroys the material world. In His own abode, however, everything is eternal and absolute. The world is not conducted by the energies or powerful agents by themselves, but by the potent all-powerful with all energies. saḥ—that Transcendence; eva—certainly; jīva-lokasya—of the conditioned living beings; māyā-mohita—captivated by the illusory energy; cetasaḥ—by the heart; vidhatse—execute; svena—by Your own; vīryeṇa—influence; śreyaḥ—ultimate good; dharma-ādi—four principles of liberation; lakṣaṇam—characterized by. The Personality of Godhead Śrī Kṛṣṇa, out of His causeless mercy, descends on the manifested world without being influenced by the material modes of nature. He is eternally beyond the material manifestations. He descends out of His causeless mercy only to reclaim the fallen souls who are captivated by the illusory energy. They are attacked by the material energy, and they want to enjoy her under false pretexts, although in essence the living entity is unable to enjoy. One is eternally the servitor of the Lord, and when he forgets this position he thinks of enjoying the material world, but factually he is in illusion. The Lord descends to eradicate this false sense of enjoyment and thus reclaim conditioned souls back to Godhead. That is the all-merciful nature of the Lord for the fallen souls. tathā—thus; ayam—this; ca—and; avatāraḥ—incarnation; te—Your; bhuvaḥ—of the material world; bhāra—burden; jihīrṣayā—for removing; svānām—of the friends; ca ananya-bhāvānām—and of the exclusive devotees; anudhyānāya—for remembering repeatedly; ca—and; asakṛt—fully satisfied. Thus You descend as an incarnation to remove the burden of the world and to benefit Your friends, especially those who are Your exclusive devotees and are rapt in meditation upon You. It appears that the Lord is partial to His devotees. Everyone is related with the Lord. He is equal to everyone, and yet He is more inclined to His own men and devotees. The Lord is everyone’s father. No one can be His father, and yet no one can be His son. His devotees are His kinsmen, and His devotees are His relations. This is His transcendental pastime. It has nothing to do with mundane ideas of relations, fatherhood or anything like that. As mentioned above, the Lord is above the modes of material nature, and thus there is nothing mundane about His kinsmen and relations in devotional service. kim—what is; idam—this; svit—does it come; kutaḥ—wherefrom; vā iti—be either; deva-deva—O Lord of lords; na—not; vedmi—do I know; aham—I; sarvataḥ—all around; mukham—directions; āyāti—coming from; tejaḥ—effulgence; parama—very much; dāruṇam—dangerous. Anything that is presented before the Personality of Godhead should be so done after due presentation of respectful prayers. That is the standard procedure, and Śrī Arjuna, although an intimate friend of the Lord, is observing this method for general information. śrī-bhagavān—the Supreme Personality of Godhead; uvāca—said; vettha—just know from Me; idam—this; droṇa-putrasya—of the son of Droṇa; brāhmam astram—hymns of the brāhma (nuclear) weapon; pradarśitam—exhibited; na—not; eva—even; asau—he; veda—know it; saṁhāram—retraction; prāṇa-bādhe—extinction of life; upasthite—being imminent. The brahmāstra is similar to the modern nuclear weapon manipulated by atomic energy. The atomic energy works wholly on total combustibility, and so the brahmāstra also acts. 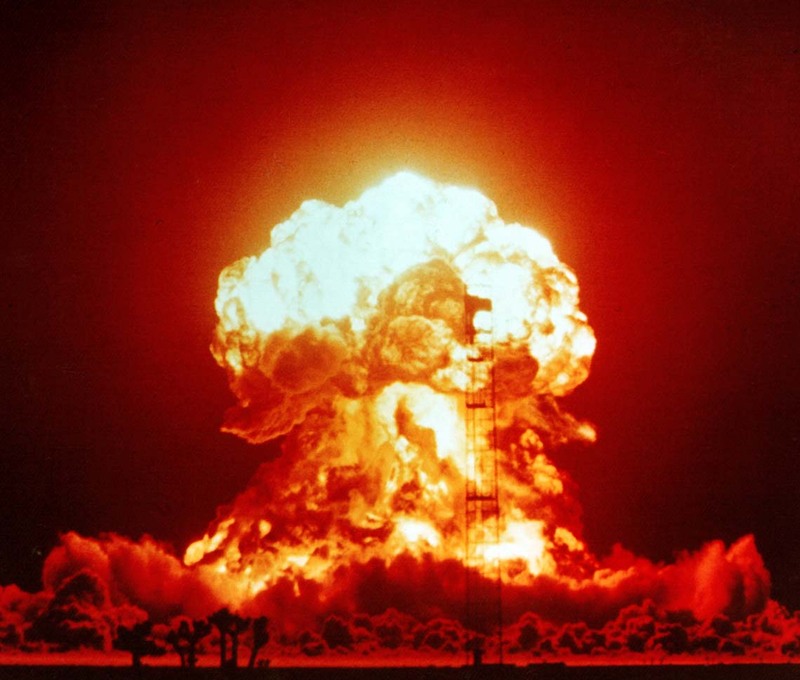 It creates an intolerable heat similar to atomic radiation, but the difference is that the atomic bomb is a gross type of nuclear weapon, whereas the brahmāstra is a subtle type of weapon produced by chanting hymns. It is a different science, and in the days gone by such science was cultivated in the land of Bhārata-varṣa. The subtle science of chanting hymns is also material, but it has yet to be known by the modern material scientists. Subtle material science is not spiritual, but it has a direct relationship with the spiritual method, which is still subtler. A chanter of hymns knew how to apply the weapon as well as how to retract it. That was perfect knowledge. But the son of Droṇācārya, who made use of this subtle science, did not know how to retract. He applied it, being afraid of his imminent death, and thus the practice was not only improper but also irreligious. As the son of a brāhmaṇa, he should not have made so many mistakes, and for such gross negligence of duty he was to be punished by the Lord Himself. na—not; hi—certainly; asya—of it; anyatamam—other; kiñcit—anything; astram—weapon; prati—counter; avakarśanam—reactionary; jahi—subdue it; astra-tejaḥ—the glare of this weapon; unnaddham—very powerful; astra-jñaḥ—expert in military science; hi—as a matter of fact; astra-tejasā—by the influence of your weapon. For the atomic bombs there is no counterweapon to neutralize the effects. But by subtle science the action of a brahmāstra can be counteracted, and those who were expert in the military science in those days could counteract the brahmāstra. The son of Droṇācārya did not know the art of counteracting the weapon, and therefore Arjuna was asked to counteract it by the power of his own weapon. sūtaḥ—Sūta Gosvāmī; uvāca—said; śrutvā—after hearing; bhagavatā—by the Personality of Godhead; proktam—what was said; phālgunaḥ—another name of Śrī Arjuna; para-vīra-hā—the killer of the opposing warrior; spṛṣṭvā—after touching; āpaḥ—water; tam—Him; parikramya—circumambulating; brāhmam—the Supreme Lord; brāhma-astram—the supreme weapon; sandadhe—acted on. saṁhatya—by combination of; anyonyam—one another; ubhayoḥ—of both; tejasī—the glares; śara—weapons; saṁvṛte—covering; āvṛtya—covering; rodasī—the complete firmament; kham ca—outer space also; vavṛdhāte—increasing; arka—the sun globe; vahni-vat—like fire. The heat created by the flash of a brahmāstra resembles the fire exhibited in the sun globe at the time of cosmic annihilation. The radiation of atomic energy is very insignificant in comparison to the heat produced by a brahmāstra. The atomic bomb explosion can at utmost blow up one globe, but the heat produced by the brahmāstra can destroy the whole cosmic situation. The comparison is therefore made to the heat at the time of annihilation. dṛṣṭvā—thus seeing; astra—weapon; tejaḥ—heat; tu—but; tayoḥ—of both; trīn—three; lokān—planets; pradahat—blazing; mahat—severely; dahyamānāḥ—burning; prajāḥ—population; sarvāḥ—all over; sāṁvartakam—the name of the fire which devastates during the annihilation of the universe; amaṁsata—began to think. The three worlds are the upper, lower and intermediate planets of the universe. Although the brahmāstra was released on this earth, the heat produced by the combination of both weapons covered all the universe, and all the populations on all the different planets began to feel the heat excessively and compared it to that of the sāṁvartaka fire. No planet, therefore, is without living beings, as less intelligent materialistic men think. prajā—the people in general; upadravam—disturbance; ālakṣya—having seen it; loka—the planets; vyatikaram—destruction; ca—also; tam—that; matam ca—and the opinion; vāsudevasya—of Vāsudeva, Śrī Kṛṣṇa; sañjahāra—retracted; arjunaḥ—Arjuna; dvayam—both the weapons. The theory that the modern atomic bomb explosions can annihilate the world is childish imagination. First of all, the atomic energy is not powerful enough to destroy the world. And secondly, ultimately it all rests on the supreme will of the Supreme Lord because without His will or sanction nothing can be built up or destroyed. It is foolish also to think that natural laws are ultimately powerful. Material nature’s law works under the direction of the Lord, as confirmed in the Bhagavad-gītā. The Lord says there that natural laws work under His supervision. The world can be destroyed only by the will of the Lord and not by the whims of tiny politicians. Lord Śrī Kṛṣṇa desired that the weapons released by both Drauṇi and Arjuna be withdrawn, and it was carried out by Arjuna at once. Similarly, there are many agents of the all-powerful Lord, and by His will only can one execute what He desires. This entry was posted in A. C. Bhaktivedanta Swami Prabhupada, Srimad Bhagavatam and tagged A. C. Bhaktivedanta Swami Prabhupada, atomic energy, brahmastra weapon, chanting hymns, nuclear, nucular weapon, Srimad Bhagavatam. Bookmark the permalink.